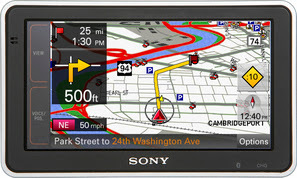 The Sony NV-U83T is Sony's newest in-car navigation device. This device features Bluetooth technology for hands-free phone calls and built-in microphone. The Sony NV-U83T has a large 4.8 inch screen with 16:9 aspect ratio and anti-glare coating so drivers can see the screen in any lighting condition. The Sony NV-U83T also has a dual view mode with 3D renditions of approaching intersections. According to Sony, their new in-car GPS system features Position Plus Technology which can provide accurante positions even when your GPS signal is low. This GPS device has the SiRF STar III GPS chip. $400 is the suggested retail price of the Sony NV-U83T. Bought this unit last week and found it to be great. Read a couple of reviews that rated it 'poor' but they appeared to be written by Garmin employees. All the 'complaints' listed have not proven to be true. The touch screen is very sensitive, mapping seems to be about the same as the last 5 gps' that I have purchased (including 3 Garmins) with the addition of text to verbal which is way better on the Sony. Will continue to test out this unit over the next several weeks on travel but so far, I'd rate it at least a 4 out of 5 stars.